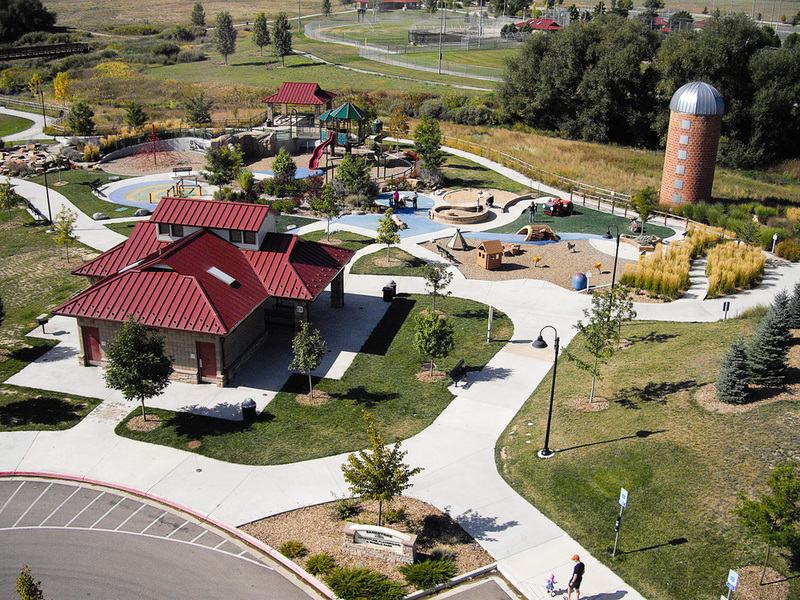 In Longmont this park has a custom innovative adventure playground with educational artwork, climbing, nature play, water splash pad, restroom, picnic shelter for parties and events. The rest of the park has skate park ballfields for baseball and softball and soccer. Design Concepts collaborated with Winston Associates for this Phase III design effort. We designed the Adventure Playground; it is adjacent to Spring Gulch and an existing silo (from the original working ranch which used to occupy the site). The agricultural history and the aquatic systems and habitats of the stream guided the theming and detailing of the playground area. 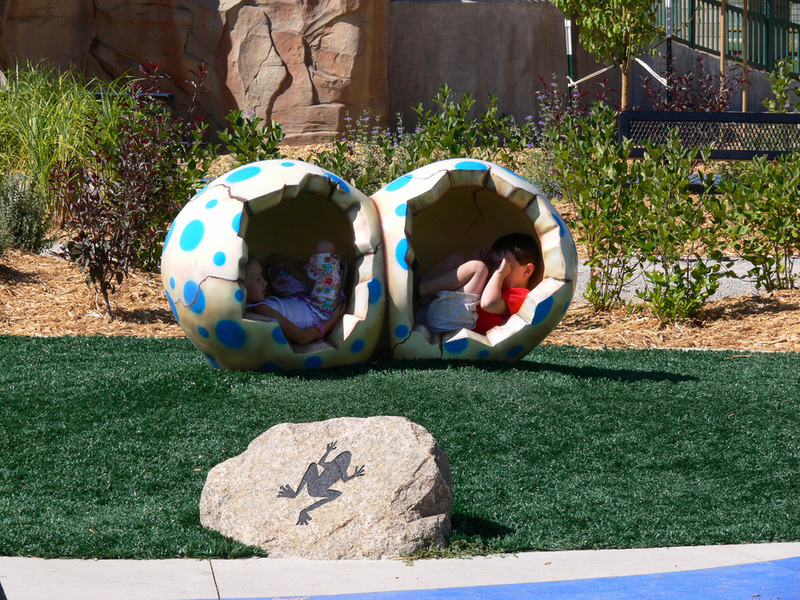 The owner's challenge for the project was to develop custom play features on a moderate budget and create a one-of-a-kind, exciting play space for children of all ages and abilities. The park is divided into three regions: the Spring Gulch Corral on the north side for toddlers and younger children; the sand and water play area in the center of the park; and the treehouse play area to the south for older children. The Spring Gulch Corral (near the silo) includes custom fabricated cow and tractor play sculptures, custom teepee and cabin play houses around a campfire ring, and musical play instruments. There is a "stream" of rubber surfacing running through the play area with a log bridge for climbing over and under. The stream begins at the water trough seating area and ends at the other end of the playground at the water splash pad feature. Animal footprints can be found at the trough from imaginary animals that might have stopped by the playground for a drink. The sand and water play area is great for digging, creating, and tactile experiencing. Ground level and accessible play pits have aquatic play sculptures, buried fossils, a turtle's nest, and water spigot. Lily pads on a colorful, rubber-surfaced pond are perfect for "leap frogging" between a fish and a frog climbing sculpture. The water splash pad keeps kids cool on hot summer days with low water spray features on push-button activators. The treehouse play area includes a custom climbing wall with slide, treehouse play structure, tire swing, web climber, and boulder labyrinth. Variations in topography encourage climbing and adventurous imaginations. Additional elements in the playground include an "agri-maze" constructed from ornamental grasses with a surprise at the end: a historical mural of the ranch site and generous plantings for shade, color, and fragrance. Seating and picnic shelters provide areas for observation and family get-togethers.